Seeger, who died Monday night at age 94, was singing with Woody Guthrie when “This Land Is Your Land” was a new song. And because he meant and lived every word of the oft-neglected final verse—“Nobody living can ever stop me, As I go walking that freedom highway; Nobody living can ever make me turn back, This land was made for you and me”—Seeger was hauled before the House Un-American Activities Committee, blacklisted and sent for a time in the late 1950s and early 1960s to the sidelines of what was becoming an entertainment industry. 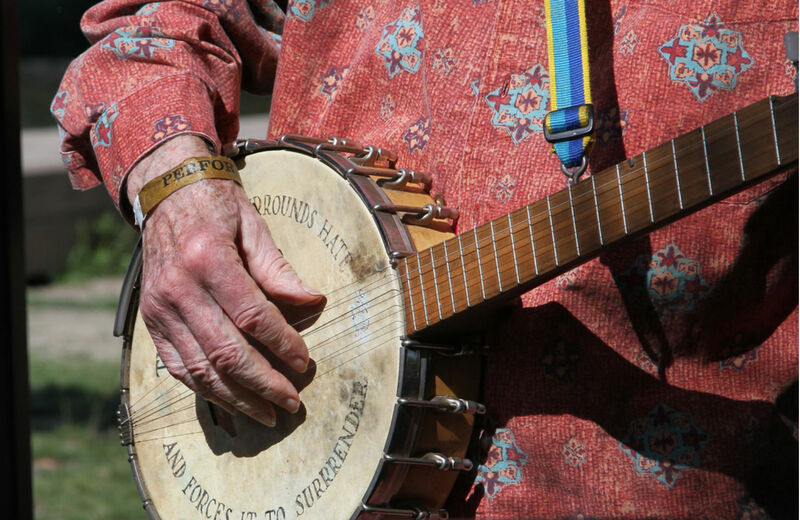 But Seeger kept singing “This Land…,” kept writing songs like “Where Have All the Flowers Gone,” kept playing a banjo inscribed with the message “This machine surrounds hate and forces it to surrender,” and kept traveling across the country and around the world—for every cause from labor rights to civil rights to environmentalism to peace. That sense and sensibility was stronger than the forces that sought to silence him. The son of privilege who lived for a good bit of time with his dear wife, Toshi, in a cabin that had no running water or electricity but offered an exceptional view of the Hudson River he loved, never lost what Springsteen hailed as a “stubborn, nasty, defiant optimism.” And the radical singer of radical songs about radical notions like loving one another, talking rather than shooting and singing rather than surrendering, lived long enough to have been a best-selling artist in 1950—crooning “Goodnight Irene” with the Weavers—and a Grammy nominee in 2014. Pete could have been excused for resting on his laurels after his contempt conviction was overturned by a federal appeals court in 1962 and the folk music boom of the 1960s restored his celebrity. But he had already thrown himself into the thick of the civil rights movement, helping young Guy Carawan introduce a variation on an old spiritual for a new movement like “We Shall Overcome.” By 1967, he was upsetting the CBS censors by appearing on The Smothers Brothers Comedy Hour and performing his song “Waist Deep in the Big Muddy,” with its closing lines: “Every time I read the paper/those old feelings come on/We are waist deep in the Big Muddy and the big fool says to push on.” It was assumed that Pete was taking a poke at Lyndon Johnson’s march into the quagmire of Vietnam. And, of course, he was doing just that. When Springsteen was asked to perform in Washington as part of the celebration of Barack Obama’s inauguration in 2009, he invited Seeger to come along. If there was a measure of the change that Obama brought to Washington, it came when Seeger stepped off the blacklist to which some on the right were still trying to consign him, and serenaded Obama. Seeger, the resilient rebel who once directed the song “Dear Mr. President” to Franklin Roosevelt, had at 89 outlasted the members of Congress who held him in contempt and the entertainment industry executives who refused him microphones. Now, as spry and energetic as ever, he ran onto the stage with Springsteen and the band. He had the microphone, and he was singing “This Land Is Your Land.” Without caution or compromise. “I know I want to sing all the verses—all the ones that Woody wrote, even the two that usually get left out,” Pete told Springsteen during the rehearsal. So it was that the newly elected president of the United States began his inaugural celebration by singing and clapping along with an old lefty who remembered the Depression-era references of a song that took a class-conscious swipe at those whose “Private Property” signs turned away union organizers, hobos and banjo pickers. Pete Seeger outlasted the bastards.